I’m on my way home today from meetings with two of my favourite organizations: Bird Studies Canada and the Nature Conservancy of Canada. I work half-time for BSC, coordinating the Christmas Bird Count and eBird nationally, and the BC and Yukon Nocturnal Owl Survey. I also help with the BC Breeding Bird Atlas, and it was fun to see preliminary species-density maps produced by Andrew Couturier pulled out at the meetings. I was happily surprised to see the packed room at the BSC staff meeting—the organization has grown steadily since it was formed by the Long Point Bird Observatory in 1995, and now has strong offices across the country doing all sorts of interesting and valuable work. The staff and board meetings at BSC’s headquarters in Port Rowan, ON were preceded each day by informal birding trips to Old Cut, the banding station at the base of Long Point. Fall migration was still going strong, with mixed flocks of warblers (dominated by Blackpolls) and good numbers of Blue Jays moving overhead. A couple of times the nets were full enough that I got to help out the talented volunteers in extracting Philadelphia Vireos, Northern Parulas, Black-throated Green Warblers and other (exotic to me) eastern species. During lunch breaks, we walked through the tallgrass prairie meadow in front of the BSC headquarters building, which has matured over the last 5 years into a glorious mix of flowers and grass, dotted with groves of small trees. 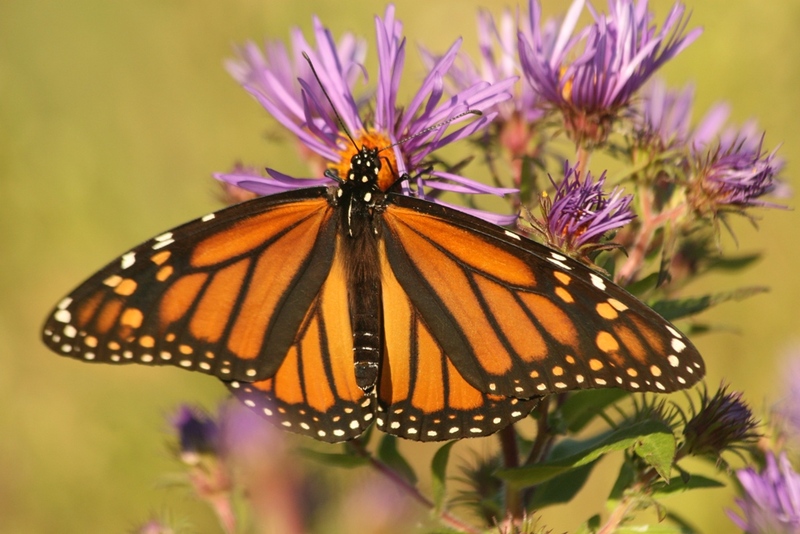 The asters were alive with nectaring butterflies, especially hundreds of monarchs that were beginning their epic journey to the highlands of Mexico. Buckeyes were common as well, and a few fiery skippers darted down the grass trails. 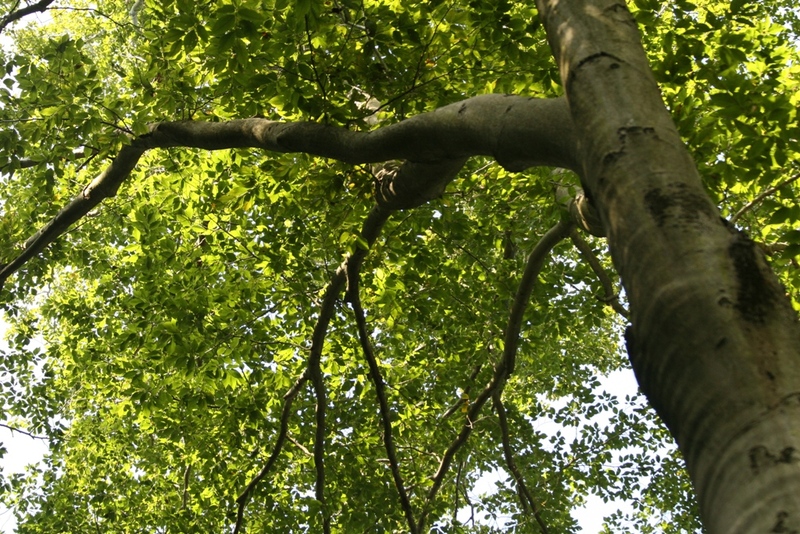 I stayed with Andrew Couturier and his family in Simcoe; on Sunday afternoon we enjoyed a walk through Spooky Hollow, a glorious patch of Carolinian forest near the shores of Lake Erie. Last Wednesday I travelled from Port Rowan to Kingston for the national board meeting of the Nature Conservancy of Canada. This is another dynamic organization that is very fulfilling to work with. I sit on the board with a cast of dedicated people from across the country, and am constantly amazed at the quality of projects our staff pull off every few months. The focus of these meetings was the work NCC is doing on the Frontenac Arch, a band of beautiful forest north of Kingston. The flora of these forests, growing on a southern extension of the granitic Canadian Shield, are a diverse mix of the Algonquin Highlands to the north and the Adirondack Mountains to the south. We toured the region on Saturday, first visiting the Elbow Lake property, an 1100-acre piece of forest and lake recently purchased and now co-managed with Queen’s University. We then drove to Hawkridge Farm, where Michael and Elaine Davies have donated a 265-acre piece of gorgeous mixed forest, with some of the most northerly pitch pines in the world. Despite the blustery fall weather, we enjoyed the early autumn colours, a few migrants birds (including good numbers of Turkey Vultures tossed on the wind) and the heart-warming stories of important habitats conserved forever. 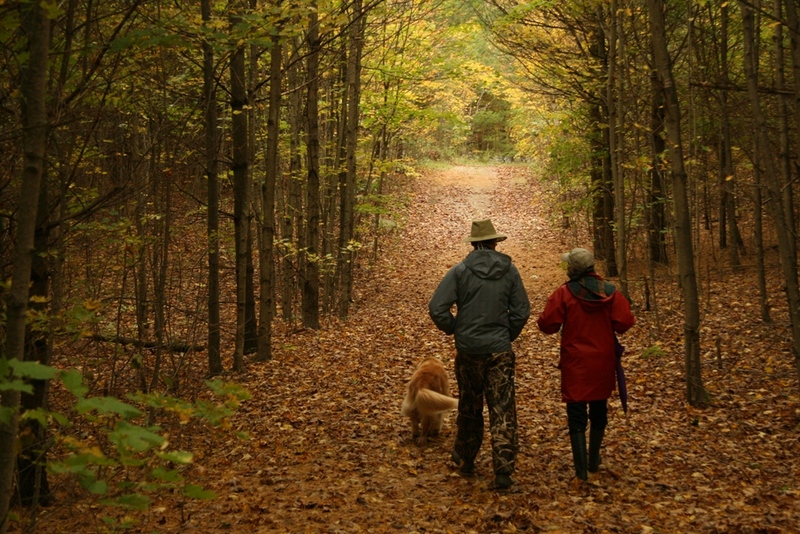 NCC biologist Gary Bell walks through the woods of Hawkridge Farm with Elaine Davies.